While I was growing up in Bisbee, Arizona, I heard the words “Neiman Marcus,” from time to time, but they were just that—words. I knew that it was a fancy store of some kind—an exotic emporium to be found only in the outside world, far beyond the intervening barrier of Cochise County’s Mule Mountains. People from Bisbee shopped in Bisbee—at Irma Courteol’s, JCPenney’s, and Phelps Dodge Mercantile. Unfortunately, the clothing to be found in those places wasn’t necessarily meant for girls who were six feet tall. Pants that were ankle length on somebody else ended up being pedal pusher’s for me. I didn’t venture into a Neiman Marcus of any kind until two years ago when my husband was doing some last minute Christmas shopping here in Bellevue, Washington. While he was forming what has turned out to be an entirely satisfactory customer relationship with the sales clerk at the Creed counter, I stepped onto the escalator and rode down to the ladies clothing department. At the time I was wearing size 26 pants, and I could tell just by looking around that the clothing on display was meant for tiny people rather than people like me. At the bottom of the escalator, and with a heart full of despair, I turned on my heel and headed back upstairs. The following year April our lives took an abrupt turn. At the urging of our doctor, Garrison Bliss, Bill and I embarked on our adventure in walking and we’re still at it. We walk every single day—usually 10,000 steps for me and 6,000 for him. We’ve learned to watch our carbs and our calories and work out twice a week with Dan Kritsonis, a personal trainer Garrison located for us on the Internet. Over time, the pounds—seventy of them—have melted away. The pants I’m wearing now vary from size 14 to size 16—a very long way down from size 26. On Christmas eve this year found us back at the Creed counter in Neiman Marcus. While Bill was fully occupied, I took another crack at that escalator. On the way down I spotted a fire engine red floor-length gown—a satiny Halston with a wide sash and a to-die-for split up the skirt. It came in three sizes—small, medium, and large. I plucked the large off the rack and headed for the nearest dressing room. I put it on. It fit perfectly. It was long enough. It was gorgeous. When the clerk told me that a Halston large was comparable to a regular size 12!! !, you could have knocked me over with a feather. The only problem with the dress was a plunging neckline which seemed to stop just a couple of inches north of my belly button. In other words, the potential for a wardrobe malfunction was enormous. When one of my books makes it to a spot in the top ten of the NYTimes, Bill throws a party, and the party for Downfall was scheduled for December 28. The moment I saw the dress on my body, I knew it would be perfect for the Downfall party. When Bill agreed, we immediately said yes to the dress and summoned the store’s alterations guy. We suggested that he add an insert of some kind to cover the portion of plunging neckline that wasn’t exactly G-rated. This was on Saturday morning, and the alterations guy said there’d be no problem with his having the dress ready by Monday afternoon. Except when Monday came around and the dress was ready, I wasn’t. I told them I’d come in to pick it up the following day. Bill is a good man and a wise one. He’s someone who chooses his battles and considers his words carefully before he speaks. It wasn’t until several hours later before he mentioned to me in passing that he thought I really did have to do something about the bra situation. Except by then it was way too late on Tuesday evening to go back to the mall. So I took the dress, left Nordstrom’s and marched up the corridor to Victoria’s Secret. When there were no low-waisted strapless bras to be found there, either, the dress and I trudged on, this time to a lingerie emporium called Soma. That’s where I found a possible solution—a bra-like device that consists of two soft cups (as opposed to plastic body armor) designed to attach under the arms by wings made of more double-sided sticky stuff. That stick-on strapless is what I came home with. When I put it on under the dress, the bodice of the dress was tight enough to hold the stick-on bra in place. If I do say so myself, the results were pretty spectacular. 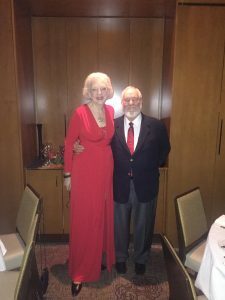 Although Garrison has since referred several of his patients to Dan, until last night when they were seated at the same table for dinner, the two of them had never met in person. I don’t know if they talked shop during dinner, but everyone at the table, including Garrison’s wife, Suzanne Wu, seemed to be having fun. The other people in the crowd were a motley crew I consider to be members of my literary “village.” Kids and grandkids were there, of course, along with long-time book sellers (J.B. and Gretchen Dickey from Seattle Mystery Bookshop and Pat and Ed Rutledge from A Book for All Seasons in Leavenworth); long time readers and friends, Jim and Lynne Norman from Bainbridge; one of my kids’ long ago elementary school principals, Ed James and his wife, Juli, from Renton; my literary agent, Alice Volpe and her husband, Champagne Al; Jim Hunt our wizard interior designer; Bonnie Abney from Second Watch fame; and Marthinus Becker, our property manager, along with some of his visiting relatives, Johnny and Brenda. As I went around the room making introductions, I was amazed to realize how many of those folks have made it into my books one way or the other. All in all it was a wonderful evening. It was Cinderella and the ball all over again, only Cinderella never got to show up in a bright red ball gown complete with a stick-on strapless bra! We had the party because my readers—blog readers and book readers—put Downfall on the NYTimes list, so thank you to all of you who made it possible for Bill and me to show our gratitude to some of the people who have been along for the ride on this thirty-plus-year journey. Please feel free to color me grateful, but when you do, be sure to color me grateful in a bright red dress. I love this story! I’ve pretty much always walked, at least as long as I had a dog to accompany me. Somehow in the last three years or so, I’ve lost 25 pounds, down from a 16/18 to a 12/14. I hope to keep it off, especially as I’ll be attending my 50th high school reunion this Spring. Love your walking stories and so happy for you. So many of us adore your writing and want to keep you around as long as possible. Happy New Year!! What a great story. Oh, what we women do to look great which you do. Is the tie Bill is wearing the expensive one you bought on a cruise ship? I can’t remember the details now. Yes, that is indeed The Tie!! We took it out of its shadow box for the occasion. Txs for a GREAT share amazing author. Congrats on NY Times top 10 list…WELL-DESERVED!!! Love your personal story, very inspirational. Yes to the utterly lovely dress that is a WOW!!! Beautiful pic of u & ur hubby. Thank you for blessing our lives with your labors of love!! Wishes for a happy, healthy, peaceful 2017 to both of you!!! Beautiful! Love reading your books and I am inspired by your weight loss journey. A little over a year ago I got the news from my doctor that I must lose weight as I am prediabetic. I am “normal” weight now after losing nearly 50 pounds. I know this will be a lifestyle choice to keep weight down by exercise and healthy diet but life is worth it. Thank you for sharing your life with all of us. Great dress! Congrats on the weight loss and fitness program. Since there is so much obesity in this country, and there are so many people who refuse to exercise, it’s great that you are so honest and open about your former weight and fitness problems. It’s really inspirational. I wish more people were as sensible as you have been. People would be happier and healthier, and we’d have much lower health care costs. Gorgeous choice…I love the red dress and you look marvelous in it! You look MAHVALOUS dahling!!! Red is definitely a dynamite color for you. I love reading how you solve problems such as the dress affair. Since I’m older than you by about five or six years, I perfectly understand the challenges you faced with the bra issue. Congratulations on your perserverance and sharp mind! You look GORGEOUS, darling! (And Bill ain’t half bad, either.) Really, I think you’re going to need new portraits for your books, your facial planes have changed so much — in a good way, of course. And congrats on your successes both personal and literary. You look absolutely stunning!! You are an inspiration and I, for one, am appreciative that you have shared your journey with us. Bill, in his bright red tie, looks very spiffy and festive too!! Love your books. My author daughter got a signed one from you for me. You look gorgeous. Wow! That dress is a stunner & you’re doing it justice!!! You look fab in your new silhouette and your red dress! It’s the carbs, baby. Lose the carbs and you lose the weight. I eat Paleo and am never hungry. Lots of good stuff to snack on. Keep the weight off. Done the yoyo dieting. Started locarb at age 80 in 2015. Still holding loss of 40# at end of 2016. Five foot nine and keeping it under 150. Love your books and eagerly await the next one! What a wonderful story. Always love your books, like going home. And you look gorgeous in that dress! I am now doing 10,000 steps a day thanks to your inspiration. It works. You look absolutely fabulous! I wish you a happy, healthy and fruitful new year, and look forward to reading your latest book. Red is definitely your color and the dress looks stunning on your statuesque figure! I had similar shopping frustrations in my youth due to being tall and long waisted. The waist in most dresses was too high to be comfortable and also looked silly. The other readers have said it all so I’ll just say —- have a safe healthy and happy 2017.